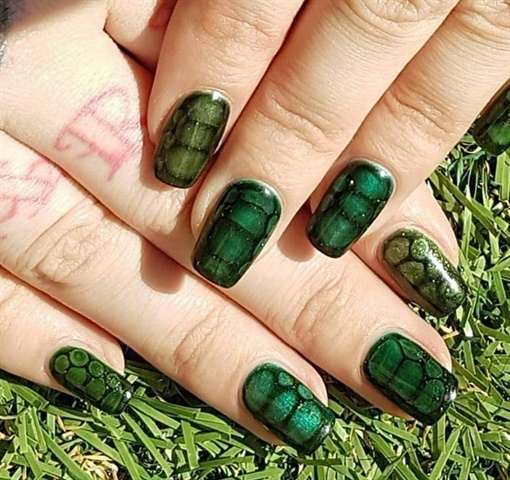 In search of the perfect turtle nails, I had a great design pointed out by Scratch Stars Gel-Polish Stylist of the Year, Kate Sawley. She uses the top coat drip design with colors that came out perfectly looking like turtle shells on each nail.Here's the video tutorial from her Facebook page. Have you done the top coat drip design before? I struggle with getting the top coat to disperse out in the awesome bubbles when trying it. Any tips or suggestions that would help me and others be successful consistently?